Being a professional entertainer means spending time on the road and spending time on the road means taking certain chances with accommodations. It's simply part of the bargain. In the course of my many travels here in the U.S. and abroad, I've been mostly lucky when it comes to lodging, thanks in large part to the diligence of the agents I work with and to the thoughtfulness of the clients I work for. But no lucky streak lasts forever and on a recent trip to Coral Springs, Florida, mine came to an abrupt and unsettling halt. I of course realize that every hotel and motel room has a history, but I strongly believe that that history should not be written, as it were, on the walls. We have all read or seen news stories about drug-induced murder/homicides in seedy motel rooms and have heard the tales of depravity and excess that take place inside the gilded chambers of five-star hotels, but all remnants of those sordid affairs should be (and in most cases, are) erased from the premises, leaving every new occupant of a room with the feeling that, at the very least, no forcible entry ever took place in it. I really don't think that is too much to ask. And yet, this is apparently not the opinion of the management of a certain lodging facility in Coral Springs, Florida. I will refer to this establishment as CSI, an acronym which you may interpret any way you like. You may take it to stand for either Coral Springs Inn, or Crime Scene Innvestigations, the latter being my preferred moniker for the place. This is a photograph taken of the door to my motel room from the inside. 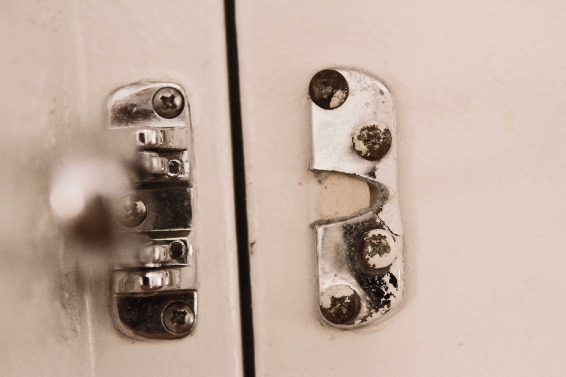 Notice that what might be referred to as the “male” half of the lock, the half on the right, and which is inserted into the “female” half, which is attached to the door jamb on the left, has been broken off, as if by some terrific force exerted from the other side of the door. Maybe a police officer kicked the door in, or maybe it was the work of a drug-addled and jealous boyfriend, or maybe it was something else entirely, but what is unmistakable is that it is the tell-tale sign of a violent struggle that I would prefer not to be reminded of as I'm settling in for the night. Though the photo below doesn't indicate criminal activity per se, it was such a perfectly ridiculous sight that I simply had to share it. It seems that the management of CSI could contrive no better place to situate a "No Smoking" sign than the bottom of this ashtray. I would love to have been present for the conversation that lead to that ingenious decision. 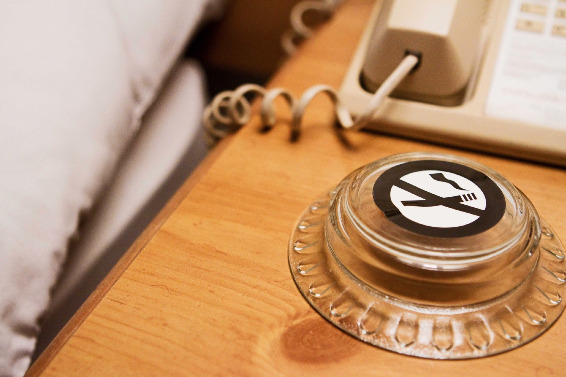 It must have been decided that table tents were either too expensive, too ambiguous, or too unwieldy and that the best possible way to discourage guests from smoking on the premises would be to furnish every room with an ashtray, but to place it upside down and put a sticker on the bottom of it, thereby disguising its original and intended purpose. 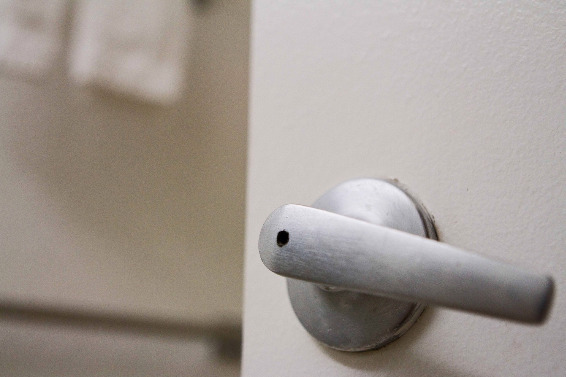 This is a close-up photo, taken from the main room, of the door-knob to the bathroom. Notice that a hole has been drilled into it, which was obviously undertaken in order to break the lock. Someone had very likely been locked in the bathroom and was either unwilling or unable to turn the handle and escape to the balmy solace of the main room. Was this person unconscious? Injured? Perhaps dead? I do not know what scenario might have unfolded in the confines of this lavatory or why it required the use of a drill to help resolve it, but I do wish that I had been spared the sight of the evidence of the episode, which compelled me to imagine what horrors might have transpired in or near the very shower in which I hastily washed myself after an evening on-stage. Even under the best circumstances, it's disquieting to consider what unpleasantness might have taken place in bathrooms used by others, but the added suggestion of a forced entry brings to mind things far more unsettling than mere stomach viruses. So if you happen to be in the business of hotel/motel management and there's a double homicide in one of your rooms, the job of restoring the room to a state of habitability is not complete simply because the folks in housekeeping cleaned the blood off the walls and flipped the mattress. Why not go the extra mile and replace the locks that have been forcefully broken and door-knobs that have been drilled through? Your guests may not notice that all the relevant hardware is intact, but they will often notice when it is not.